The last time we talked about the legendary Hannibal and his activities during the Second Punic War, we took a look at the Battle of Zama, during which Hannibal was defeated by Scipio Africanus the elder. When the Battle of Zama occurred, Hannibal was already a well-known general with a reputation. Let us take a look at one of his earlier battles: The Battle of Trebia was one of the first big military confrontations of the Second Punic War and took place in December of 218 BC. The Roman consul Tiberius Sempronius Longus was ordered by the Senate, to come to the aid of a Roman general, who had been wounded and was not able to move his army. It seems like historic irony that the general in dire need of reinforcements was named Scipio, just like the general who was destined to defeat Hannibal. The political and military situation was complicated: Hannibal and the Romans relied on Gauls and Celts and other allies whose loyalties were not to be trusted fully. While Scipio advised his comrade Sempronius to wait out and let the harsh winter and time be on their side, Sempronius had motives of his own: While Scipio was recovering, Sempronius was in command and an attack under his command would benefit him in an election that was just around the corner. Through espionage, Hannibal knew about these circumstances and set a plan in motion: In the morning, part of his cavalry was sent to a Roman camp close by to attack and quickly retreat. Sempronius jumped at the chance and sent troops of his own. The soldiers that were sent by Sempronius did not have breakfast and had to cross the river Trebia during winter. When they arrived on the other riverbank, they were so cold, they could barely hold their weapons. Easy prey for Hannibal‘s men, who had full bellies and oiled up their bodies in front of the fire to keep warm. 2 Carthaginian cavalry 10,000 in all, 5,000 each wing? Elephants on each wing also. 3 Carthaginian infantry 20,000 heavy infantry supported by 8,000 light out front, falling back to wings. 5 Trebbia river Schematic representation only. 6 Roman cavalry 4,000 in all, 2,000 each wing? 7 Roman infantry More than 38,000 in all: 18,000 Romans including 12,000 heavy and 6,000 light, 20,000 Italics, unknown number of Cenomani. 8 Roman camp Sempronius’ camp. Scipio’s camp was at Ripa Alta upstream. 0 City of Placentia(Piacenza) Approximation. Problem: the 20,000 Roman survivors were on left bank yet fell back on Piacenza. 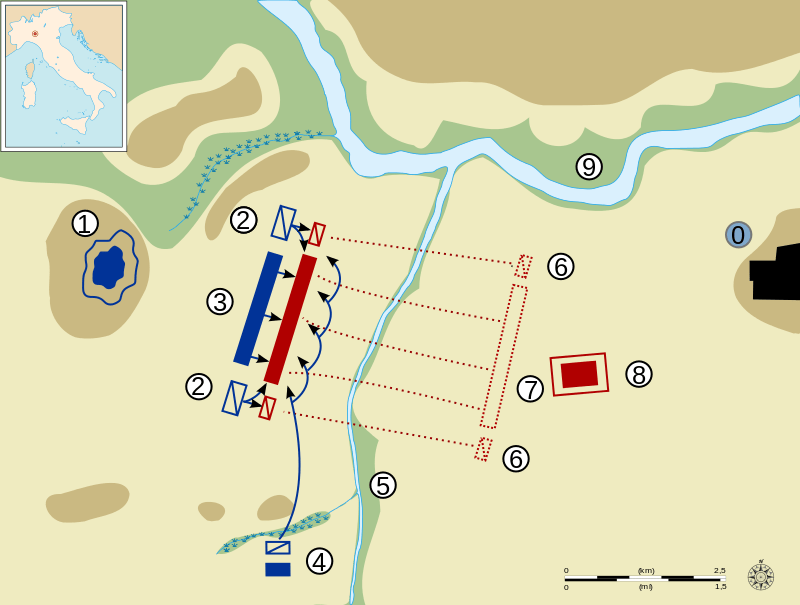 Right before the armies met on the field, Hannibal ordered the cavalry, that had provoked the Romans before, to attack the strung-out troops from the flanks. This further diminished the fighting strength of the Romans who met their opponents out of ammo and suffering from hypothermia. To make things worse for the Romans: Mago, Hannibal‘s younger brother had been hiding with over 2.000 men and now engaged the enemy from the rear. Although Sempronius‘ strategies were ill-advised, his battlefield tactics were good but not effective enough to defeat Hannibal. This battle marked the first major loss for the Romans in the Italian mainland. Players of Travian can learn something from this battle: always consider your surroundings, how fast reinforcements can reach you and do not rush into action for the wrong reasons. Until next time, happy raiding!